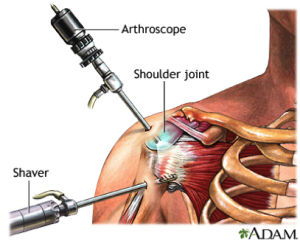 Arthroscopic surgery is performed using a narrow fiber optic light and camera which is inserted into a joint through 2-5 incisions each less than 5mm in length. The surgeon views the image from the camera on a computer screen. Small instruments can be inserted into the incisions to allow the surgeon to move joint stuctures, diagnose injuries and repair, reconstruct or remove damaged tissue. Gentle traction will be used to position your arm, and sterile fluid is pumped into and out of the joint to help your surgeon view the inside of your joint.